I am going to start blogging about the North Vancouver ReStore because I feel that everyone should know about this incredible place! 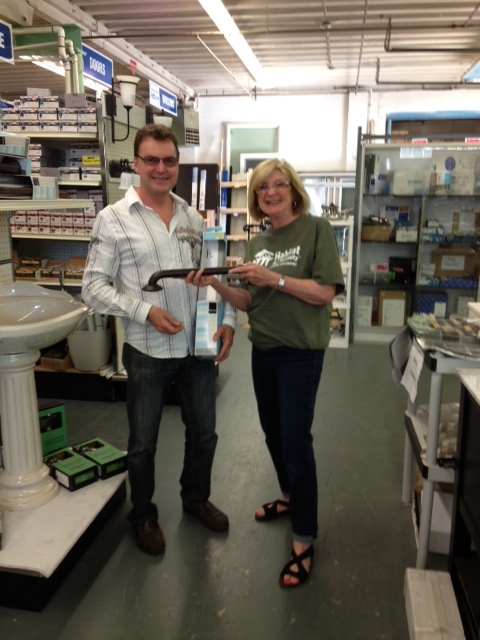 The ReStore sells new and used high-quality building supplies, appliances and home decor items. The proceeds cover 100% of the cost of Habitat for Humanity’s Greater Vancouver operations. That means that every dollar donated to Habitat for Humanity goes directly towards building homes for families in need in the Lower Mainland. I volunteer in the North Van store and today I had the pleasure of assisting a fellow realtor (Rod McLean). He loves the store and always leaves with tons of goodies! He told me today that one of his friends bought some "safety bars" and they were double the price of the ones we have in the store. It really is alot of fun to visit the store and I guarantee you will not leave empty-handed! AND ALL FOR A GOOD CAUSE! Check out the picture below of Rod and myself!